An access list is a sequential list consisting of at least one permit statement and possibly one or more deny statements that apply to IP addresses and possibly upper-layer IP protocols. Time-based ACLs is a Cisco feature introduced in the Release 12.0.1.T to allow access control based on time. The time range, identified by a name, can be ‘absolute‘ or ‘periodic‘. 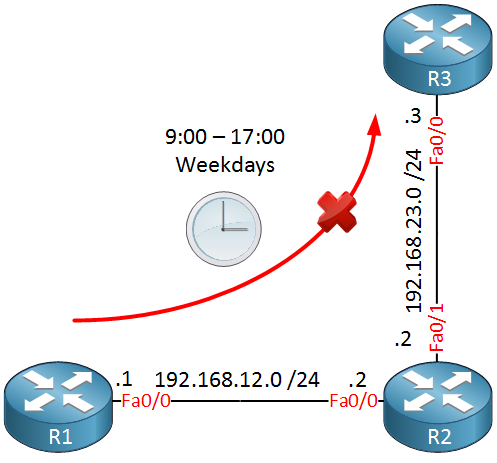 Permit SSH router access on the weekends from 8:00 to 22:00. Time-based ACLs is a Cisco feature introduced in the Release 12.0.1.T to allow access control based on time. The time range, identified by a name, can be 'absolute' or 'periodic'.